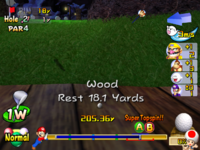 Mario Golf: Toadstool Tour is the third game in the Mario Golf series (developed by Camelot Software Planning), the second home console installment and was released for the Nintendo GameCube. It also earned the Player's Choice rating. Daisy, Peach, Luigi, and Mario celebrating results of excellent tee shots. The game's opening starts with Mario and Luigi looking at a shiny trophy and commenting on how nice it looks. Peach and Daisy call on them saying it's tee time on the planned golf course. 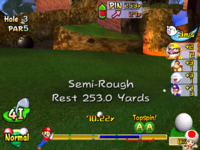 As the four friends are shown making excellent tee shots, Wario and Waluigi are shown from behind, extremely jealous of how well Mario, Luigi, Peach, and Daisy do. The two hear a noise and turn around to see Yoshi and Koopa Troopa together to start their round of golf. 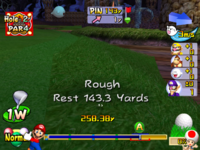 Wario and Waluigi clench their golf clubs while laughing, and prepare to join them. They all take turns hitting their golf balls, and Yoshi hits near a Chain Chomp. When he tries to get it back, the Chain Chomp wakes up and barks at Yoshi, scaring him and making him fall over. 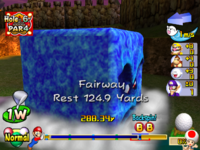 Wario attempts to hit the ball out of the bunker, but just manages to fling sand into Waluigi's face. Minutes later, Waluigi attempts to putt the ball into the hole, but fails miserably after a few tries - resulting in Yoshi and Koopa Troopa falling asleep. Meanwhile, Donkey Kong and Diddy Kong walk past the sleeping Yoshi and Koopa Troopa; Wario and Waluigi attempt to challenge them next. 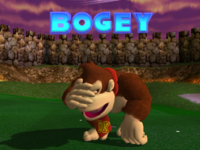 After Donkey Kong shows his golf prowess to Diddy, Wario and Waluigi, Wario, despite his terrible swing, attempts to hit the ball a long way, until it goes out of sight into the forest. Wario and Waluigi start celebrating until they hear a loud roar. The ball suddenly flies back and lands in front of Wario. The two look up and see Bowser coming out of the forest completely enraged because he has a black eye from the golf ball. Bowser gives chase after Wario and Waluigi in his Koopa Clown Car and starts firing Bob-ombs at the two as they run around Lakitu Valley past Birdo and Boo, who were playing a game of golf on their own. Fortunately for Wario and Waluigi, they find a yellow Warp Pipe that is too small for Bowser and his Koopa Clown Car to fit through. Wario and Waluigi come out the other side of the pipe and stop to catch their breath; however, Bowser and the Koopa Clown Car appear right above them seconds later. Bowser takes out another Bob-omb threatening to drop it, resulting in Wario and Waluigi screaming in fear for their lives. Mario attempting another shot as Daisy, Luigi, and Peach watch from behind. Meanwhile, Mario is preparing to take a shot on that same course with Luigi, Peach, and Daisy observing from behind. As Wario and Waluigi still try frantically to escape from Bowser's looming threat by going through an enormous metal door, Mario hits his ball with his golf club. Wario and Waluigi manage to open the door and continue their escape attempt. But as they did so, Mario's ball hits Wario and Waluigi, giving them black eyes as well, and knocks the Bob-omb off Bowser's hand. This ultimately results in an explosion claiming Wario, Waluigi, and Bowser as the victims. Mario, Luigi, Peach, and Daisy witnessed it from afar, completely baffled as to what caused the blast that came out of nowhere. The game differs greatly from that of the previous game in both controls and visuals. The game uses 3D renders for the designs of characters and courses, changing the camera view to be able to view much more of each hole in detail. Pressing or allows the player to view an overview of the hole and allows them to study the topography of the whole of it or just the green, in order to adjust their shot, and can look around using . The green also now displays moving topographic lines that follow down its path, increasing in speed the more the green slopes. A new control system has also been added, with a manual and automatic swing. The automatic swing is used by pressing to set the power for the shot and then letting the game decide where the sweet spot marker ends up. A manual swing involves pressing when choosing power, then pressing either or to set the sweet spot impact marker. This allows the use of a new feature, spin, to be used on shots. Backspin, topspin, super backspin or super topspin can be used, affecting the ball's line of movement on the ground. Topspin sends the ball rolling forward while backspin causes the ball to roll back; these spins make the ball roll a shorter distance than their super versions. Different characters' spin will be more powerful with higher spin levels. The ability to change where the ball is hit is also present from the two previous games, allowing different types of shots to be taken. Approach shots, used when players approach the pin, appear, as well as the limited number of power shots. Power shots have longer drives than normal shots, and only six can be used at a time. If a player does a perfect power shot (meaning they have aligned the first bar at the far left and perfectly aligned the second bar), it is not used up. Hole-in-One The player has sunk the ball in the hole with one stroke. It is easiest to receive this result on a Par 3, but it is possible to attain a Hole-in-One on a Par 4 or 5 as well. Albatross The player has sunk the ball three below par. The game awards this for a score of 2 on a Par 5, or 1 on a Par 4. 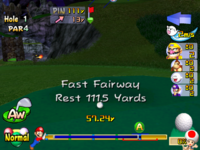 Without Linking with Mario Golf: Advance Tour, these are usually much harder to achieve than a hole-in-one. Eagle The player has sunk the ball two below par. On a Par 3, the game records this as a Hole-in-One instead. Birdie The player has sunk the ball one below par. Par The player has sunk the ball with a neutral score for the hole. Bogey The player has sunk the ball one above par. above par The player has sunk the ball the number indicated above par. The highest score a player can take is equivalent to triple Par (i.e. +6 for a Par 3, +8 for a Par 4, and +10 for a Par 5). Selecting Give-Up will penalize the player with a triple Par score and retire the hole. NOTE: The US version of the game has a glitch that records Hole-In-Ones on Par 4 and Par 5 holes as Albatrosses. This is fixed in the European and Japanese versions. Fairway A large and common terrain that is the easiest to hit the ball from. It has no effect on the golf ball. Fast Fairway Similar to fairway, except there is less friction between it and a regular fairway, meaning balls bounce farther and higher and roll more. Green The terrain where the pin, hole, and flag are located. It is surrounded by a Fringe, and golfers need to use putters if they are on the green. Tournament Green Similar to regular greens, but, as with fast fairways, there is less friction in the ball, meaning it rolls farther. Fringe The area of grass surrounding the green, with a topography inbetween the green and the fairway. Bunker The most common negatively affecting terrain, bunkers affect the ball's lie and the ability to hit the ball accurately. Sand wedges are typically used to get balls out of bunkers. Beach Bunker Found only in Blooper Bay, these act similar to regular bunkers, except they don't negatively affect the ball's lie as much as them. As their name suggests, they are found next to the ocean. Grass Bunker Found only in Bowser Badlands, these bunkers are heavier than the heaviest rough and greatly affect a ball's lie. Semi-Rough Semi-Rough is found in the fringe area, between fairways and the rough. They slightly affect the ball's lie. Rough Roughs are deeper than the semi-rough. They affect the ball's lie more than Semi-Rough, but less than a Bunker. Heavy Rough The heaviest rough, these greatly affect the ball's lie, even more than a Bunker or Beach Bunker. They are located on the deepest areas of the rough, usually before an O.B. Flower Patch Uncommon terrain that affects a ball's lie, however not as much as Bunkers and the Rough. Whenever a shot lands in a Flower Patch, Pikmin will be shot out, wailing. Rock Terrain that does not have much friction and causes balls to bounce out of it. When a ball lands on it, it hurts the ball's lie, though not as much as Grass Bunkers or Heavy Rough. Brick Like Rock, terrain that does not have much friction and causes balls to bounce out of it, and also hurts the ball's lie. Brick has a very harsh, echoing ricochet sound. Wood Similar to Rock, Pipe, or Brick, where the ball frequently bounces off of it. Like those three terrains, it also hurts the ball's lie. Pipe Terrain that also doesn't have much friction and causes balls to bounce out of it. Like Rock, Brick and Wood, it adversely affects the ball's lie. They are only found on Peach's Castle Grounds, where they are usually used to transport balls from one part of a hole to another (similar to Warp Pipes); however, some pipes are used as tunnels, where the ball will roll through the pipe and land out of the other side from where it entered (usually into rough). Waste Area Waste areas have high friction and prevent a ball from bouncing. They affect the ball's lie, though not as much as Rock. Heath Found only in Bowser Badlands, this terrain very heavily affects a ball's lie, moreso than the deep rough. Out of Bounds These are designated areas of the course that players cannot land their balls in. These includes endless pits, being too far off course, water, lava, and areas with Chain Chomps occupied in. When players receive an O.B., they need to redo their shot with a cost of a stroke penalty. 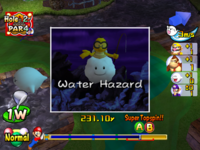 The hazard is signified by a Koopa Paratroopa. Water Hazard If a ball lands in water, it is considered an O.B. and players need to reshoot the ball with a stroke penalty. The hazard is signified by a Lakitu. Tree Hazard If a ball gets stuck in a tree or lands too close to a tree, players need to reshoot the ball with a stroke penalty. Warp Pipe Warp Pipes warp balls to another location in the golf course. Bouncing Mushroom Bouncing Mushrooms causes balls to bounce off of the mushroom. Boo Located only in Bowser Badlands, these enemies act as walls to flying balls, slowing or stopping a ball's progress through the air. Thwomp Located only in Bowser Badlands, if a ball rolls underneath a Thwomp, the Thwomp smashes the ball, which heavily hurts its lie. Thwomps also act as walls to block balls. Bob-omb Located only in Bowser Badlands, if a ball hits a Bob-omb, it explodes, sending the ball backward. It affects flying balls more than grounded balls. When the Bob-omb explodes, it leaves behind a bunker. Piranha Plant These enemies eat balls that roll into their Warp Pipes, and they spit them out to a spot. Some Piranha Plants spit balls out to O.B. zones. Chain Chomp These enemies occupy certain O.B. zones. If a ball rolls into an area with Chain Chomps, the Chain Chomps wake up and an O.B. is called. Wind Wind causes the ball to travel in the direction it is blown at. Higher wind means the ball is more affected by the wind. Crosswinds (ie winds that blow from the left or right of the direction of the player's aim) affect the ball more than winds that blow from front or behind. In addition, balls with a higher trajectory are more affected by the wind than balls hit with lower trajectories. Rain Rain lowers drive distance of the ball, as well increase ball friction that the ball rolls less, especially while putting. 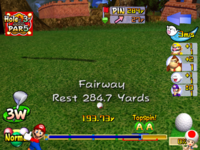 There are a wide variety of game modes offered in Mario Golf: Toadstool Tour, from challenging tournaments to training sessions to collecting coins to shooting the ball through rings. All of the game modes are explained briefly below. Note that multi-player game modes not marked with an asterisk (*) can also be played with 1 player and AI opponents. Tournament - The player competes against others for first place in an 18-hole round of golf and to earn best badges on specific holes. The lowest score at the end of the tournament is the winner. Character Match - Compete in a one-on-one challenge against a computer character on any course using match play rules. Star Characters can be unlocked by accepting challenge from characters and winning. Ring Shot - Compete by hitting shots through various rings on a course while still finishing at or under par. Challenge - Complete Ring Shot holes to earn stars which unlock even more holes! Complete them all to unlock a special surprise. Speed Golf - Complete a round of golf in the fastest time possible. Training - Practice golfing on any hole. During gameplay, the player can select a course and hole, adjust the wind strength and direction, switch between sunny or rainy weather, front or back tees, and regular or tournament greens, and change the pin's location. Doubles - A 2-on-2 game of golf. For 1-4 players. Club Slots - Play using a limited amount of clubs. When playing with four slots, there is an added gimmick for the fourth slot (i.e. no wind, double points, extra mulligan, etc.). Coin Shoot - Hit the ball near coins to collect them. Earn the highest coin total to win. The coins make up various pattens, such as the Triforce from the Legend of Zelda series, while another looks like the Nintendo GameCube. Quick Cash - Collect as many coins as possible in two shots under par (for example, on a par 5 hole, the player has 3 shots to collect coins), without worrying about sinking the ball. Cash Cup - Collect as many coins as possible and finish the hole with par or better. Failure to do so will result in 0 coins for the hole. Stroke Play - Get the fewest total strokes on a course to win. Beat courses in tournament mode to unlock them here. Side Games - Fun challenges that test and improve your golfing skills. Birdie Challenge - Compete on Congo Canopy to see how many consecutive birdies you can earn. Practice Games - Hone your approaching and putting skills by playing these unique challenges. There are novice, intermediate and expert difficulties. Match Play - Standard golfing with a different scoring system. Winning a hole earns you a medal; earn the highest amount of medals or mathematically eliminate the opponent to win. For 2 players only. Skins Match - Similar to Match Play, but for 2-4 players. The player who finishes with the lowest score on a hole earns a point. Whoever has the most amount of points at the end wins. Near-Pin - Compete in Congo Canopy to get the shortest total distance from the pin in one stroke. If your ball is not on the green in one stroke, it will count as being 100 feet away. Star Tournament - Unlocked once the tournament mode on Bowser Badlands is beaten and a star version of a character is obtained. Same as tournament mode, except the player will compete against tougher star characters while using the back tees and tournament greens. Beat these to be able to use the tournament greens in other game modes. For 1 player. One-On One-Putt - Unlocked by beating birdie challenge on all 18 holes (which will also unlock Bowser Jr.). Similar to birdie challenge, except the first shot must land on the green and the second must go in the hole (resulting in a birdie). If the first shot is not on the green, the player will lose. Beat this with 1 player to unlock the tournament greens for Congo Canopy. For 1-4 players. Special Tournament - Unlocked by holding on the title screen and pressing the button. Hole-in-One Contest - Like the Near-Pin Contest, except the game is played on the Par-3 holes of a selected course. For 1 player. Ace Computer Difficulty Mode - Different unlocking criteria dependent on version. Japanese Version - Accept challenge from Bowser and win in Character Match mode. This will also unlock Bowser's Star Character. PAL Version - Complete (in first place) the Bowser Star Championship once. NTSC Version - Complete (in first place) all Star Tournaments with all Non-Star Characters. 102 Tournaments in total (six Normal Tournaments needed to unlock Star Tournament). Including transferable characters, a total of 18 playable characters are featured in Mario Golf: Toadstool Tour, consisting of 12 default characters, 4 unlockable characters, and 2 transferable characters. This game marks the first playable appearance of Bowser Jr., Shadow Mario and Petey Piranha, as well as Diddy Kong's first appearance in a Mario game. Note that Impact, Control, and Spin are on a scale of 21. Drive - How far the ball travels in the air for on a perfect shot with a driver (1W). Trajectory - What direction the ball travels in when hit. For right-handed players, if the ball curves to the left, it's a draw, to the right, a fade, far to the left, a hook or far to the right, a slice, and vice-versa for left-handed players. Height - How high or low the ball travels in the air. The higher the ball travels, the more affected by wind it is, the more it bounces high and is affected by spin. The lower it is, it gets less affected by wind, makes the ball bounce further, roll more and get more affected by lie. Impact - The amount of the sweet-spot marker left for certain shots. Less makes bunker shots much harder to land and often results in mis-hits. Control - The amount of movement away from the targeted spot when hit off the perfect impact point, The higher the amount, the less the ball moves from the target spot. Spin - The amount of affect spin has on the ball. Having a higher amount will mean that the ball will roll further with the use of spin. Quote It's-a me! I've been on fire lately, but I hope you'll challenge me! Quote Oh dear... I've practiced, but no one will play me. Will you play against me? Quote Hey! I adore golf! It seems you do, too! Want to play a round of 18? Quote What's up? I'm new, but golf is my thing! And I'll go toe-to-toe to prove it! Quote Golf is perfect for me, 'cause I love to roam! Why don't we square off? Quote Hi! I might be small, but I'm a huge fan of golf! Care to match skills? Quote Smacking the ball a mile is great. Now let me show you what I mean! Quote It's me, Diddy! I'm hooked on this game, and I wanna show you my skills! Ready? Quote Challenge me? You? I'm the best golfer in the world. I'm not scared! Quote You might be gettin' better, but nobody cheats better than me! You got that?! Quote I love to golf, and now I want to play other golfers! Are you in? Quote Bwaaahhh ha HA! I'm so good, golfing is starting to get boring! BORING!! Obtain 50 Best Badges in Tournament Mode. Complete all Ring Attack holes. Complete all side games (except the Birdie Challenge) on beginner, intermediate and expert. Neil and Ella can be transferred into the game by connecting Mario Golf: Advance Tour for the Game Boy Advance with the Nintendo GameCube. Cheep Cheep Falls This course has a conventional nature like Lakitu Valley, but also contains ponds and rivers as water hazards. Trees and subtle traps are also more abundant. Beating the Lakitu Cup. Shifting Sands This course is likely based off Shifting Sand Land and contains many bunkers. There are also waste areas, cacti and rocks that act as hazards. Beating the Cheep Cheep Tournament. Blooper Bay This course features some unconventional elements, such as Fast Fairways, where surfaces on which the ball roles further than normal, and is set in a tropical resort area. Many of the bunkers are shaped like recognizable objects, such as Seagulls or Super Stars. Beating the Sands Classic. Peach's Castle Grounds This course features many elements unique to the Mario franchise, such as Warp Pipes, Chain Chomps, and giant Mushrooms. King Bob-omb also makes a cameo here, as well as Pikmin. Beating the Blooper Open. Bowser Badlands This dark, difficult course designed by Bowser contains Bob-ombs, Piranha Plants, and Whomps, as well as elements such as lava. Extra care will need to be taken when playing on this course. Beating the Peach's Invitational. On July 28, 2003, Nintendo of America released Mario Golf: Toadstool Tour (Target Bullseye Tour Included -- Exclusive Version) through Target stores. This version allowed players to play the Bullseye Tour in the Special Tournament mode. Codes issued from this version of the game could be submitted through the official website. Nintendo prizes were mailed out to the winners. The promotion ended on August 31, 2003. Super Mario Bros.: In the character select screen, Princess Peach sings the first few notes of the overworld theme. A remix of the underground theme is heard during the player's attempt to score a birdie. Super Mario 64: Shifting Sands is possibly based on Shifting Sand Land from this game. A remix of the Peach's Castle theme is heard in Peach's Castle Grounds. A remix of the Bowser boss fight music is heard in Bowser Badlands. 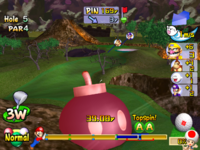 Hole 8 of Peach's Castle Grounds has a mountain with a similar layout to the one in Bob-omb Battlefield, and Big Bob-omb appears there, too. Donkey Kong 64: Donkey Kong and Diddy Kong's voice clips were reused from this game. Pikmin: Whenever a player's golf ball lands in a flower patch, Pikmin fly out. Super Smash Bros. Melee: Some of Mario's voice clips from this game are recycled for Shadow Mario, albeit pitched down. Super Mario Sunshine: Blooper Bay is heavily based on Gelato Beach, an area in Isle Delfino. Mario Kart: Double Dash!! : The countdown timer sound effect is reused in this game to signal the start of the race or battle for the characters. Mario Power Tennis: The opening logos are reused. IGN 8/10 Tiger is still king. But if you're looking for something more on the arcade side, Mario Golf more than delivers, especially if you consider yourself a Nintendo fan and can appreciate the wide selection of classic characters -- all playable -- in the game. GameSpot 7.2/10 All in all, Mario Golf is an excellent adaptation of the N64 title, and it's a Game Boy experience that stands well on its own. The music is even reflective of the N64's - it varies, depending on how well you're doing, and it's constant without being annoying. The only thing missing, audiowise, are the taunts, and frankly, you'll probably do just fine on your own. Gamespy 7.8/10 Despite its camera problems, its visual deficiencies, and the fact that it does some things worse than the original, I'm having lots of fun with Toadstool Tour. Sure it's not as good as the latest Tiger Woods or even Hot Shots Golf 3. Nor is there much new here from the original Mario Golf. But I love playing as these characters. Seeing the behavior of Mario, Koopa, Peach (my favorite) Waluigi, and the others makes for a really fun time. 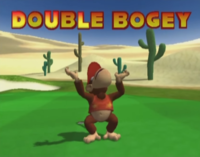 Even though the game's problems keep it from being great, it's still an enjoyable title for Nintendo fans and gamers looking for a simple golf game. 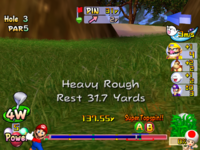 For this subject's image gallery, see Gallery:Mario Golf: Toadstool Tour. This game's scoreboard features many characters from other Mario games, including Goombario and Hammer Bro. Possibly coincidentally, one of these referenced characters has actually never been seen since the Super Mario Adventures comic, where he was a minor hero. Professional golfer Gary McCord recommended the game in his book Golf for Dummies. This was one of the last games Nintendo published to have the "Official Nintendo Seal of Quality" label on the box and the disc, as Nintendo changed the label in late-2003 to read "Official Nintendo Seal". A Player's Choice box was released after 2003; however, on this version, the "Official Nintendo Seal" appears on the back only, while the "Official Nintendo Seal of Quality" appears on the front and the disc. 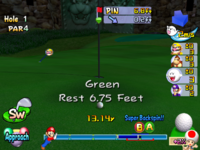 ↑ Mario Golf: Toadstool Tour (Target Bullseye Tour Included -- Exclusive Version) Game Profile. IGN GameCube. Retrieved on March 29, 2008.